Dr. Ory Wiesel is a thoracic surgeon with expertise in the management of pleural mesothelioma cancer at Maimonides Medical Center in Brooklyn. Dr. Ory Wiesel’s arrival to Maimonides in 2017 sparked the creation of the Brooklyn Mesothelioma Center, a multidisciplinary program dedicated exclusively to this rare and aggressive cancer. Previously, patients from Brooklyn looking for a mesothelioma specialty center traveled to Manhattan or beyond, adding to the already difficult burden of this cancer caused by asbestos exposure. Wiesel received his training at Brigham and Women’s Hospital in Boston, where he worked closely with Dr. Raphael Bueno. Much of what Wiesel learned in Boston has been integrated into the Brooklyn Mesothelioma Program. It goes well beyond his surgical expertise. It’s also a philosophy Wiesel learned at Brigham, which originated from Dr. David Sugarbaker, the renowned surgeon who built the program and served as a pioneer in advancing the treatment of pleural mesothelioma for decades. Wiesel works alongside Dr. Jason Shaw, director of thoracic surgery at Maimonides, and Dr. Igor Brichkov, another surgeon who is part of the thoracic cancer program in Brooklyn. They collaborate with pulmonologists, pathologists, radiologists, medical oncologists, nurses and other mesothelioma specialists to discuss each case, developing a personalized treatment strategy for every patient. Maimonides has the only full-service cancer center and fully accredited Breast Cancer Center in Brooklyn. It is known for its cutting-edge research and technology, taking pride in focusing on the whole person, and not just the cancer. In addition to performing the aggressive, tumor-removing surgeries for mesothelioma, Wiesel also is trained in minimally invasive and robotic surgery. He handles esophageal cancer, lung cancer, mediastinum and chest wall diseases. He received his degree from Semmelweis Medical University in Hungary, where he received the Dean’s Special Distinction Award in 2005. He did his residency at the Tel Aviv Medical Center in Israel. 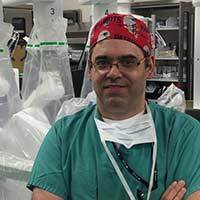 His thoracic surgery fellowship was at the Harvard University Medical School in Boston, where he started working at Brigham and Women’s. Wiesel, who is fluent in English, Arabic, Hebrew and Hungarian, has earned several awards for his work, including the 2015 AATS Graham Foundation Award and the Khuri Shukri Award for clinical excellence. One of his research topics is surgery for the elderly. Disclaimer: Dr. Ory Wiesel has no professional affiliation with Asbestos.com.